When you have about 10,000 unclaimed motorbikes, three-wheelers and other vehicles on hand, you are running out of space to store them. You are also running out of ideas on what to do with them, because you do not have the budget to maintain vehicles confiscated for one reason or the other. People are supposed to pay fines and reclaim them, for the most part, but when they don’t, the vehicle rusts away in an open area or warehouse with finite space. In HCM City, authorities have recently stepped up their crackdown on three-wheelers, self-modified vehicles, vehicles carrying outsized goods or the so-called “blind” vehicles that have no lights or number plates, and in some instances, no brakes either. Of course, this has meant that the number of temporarily seized vehicles has been growing non-stop, and the number of those remaining unclaimed after the mandated deadline has been going up, too. 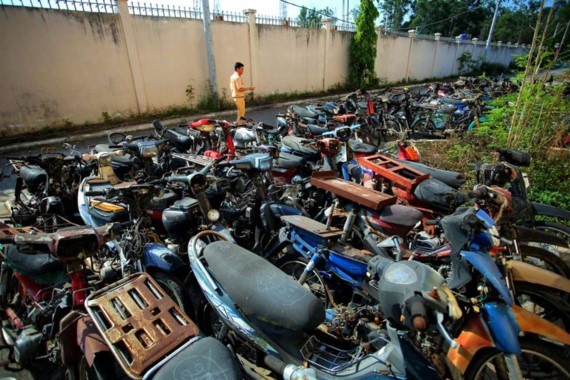 HCM City authorities took a decision recently to sell the unclaimed vehicles as scrap, with the money raised going to the State Budget. According to decision, the scrap liquidation solution would apply for vehicles that owners have not claimed seven days after their temporary confiscation. Here’s where someone should step in and say, whoa, hold on to your horses. A closer look at the 10,000 or so vehicles to be sold as scrap is warranted at this point. Many of them have remained in the city’s “stores” for years and gathered significant rust. But local reports say that they there are also a large number of relatively new, expensive models: SH, Liberty, Spacey, etc. Is selling such vehicles for scrap value a cost-effective decision? It is a fact that the city has the right to decide on other ways to clear the inventory of unclaimed vehicles. At a time when there is a lot of talk about both public citizens and the Government needing to practice thrift and avoid wastage, what does this decision say? Of course, the phenomenon of unclaimed vehicles is not unique to HCM City. In Hà Nội, hundreds of them can be seen in storage areas around the Mỹ Đình Bus Station, and in Bồ Đề ward in Long Biên District and Nam Trung Yên apartment building area in Cầu Giấy District. Here, too, the bikes range from very old ones to modern models that cost around VNĐ200 million (US$8,900) each. A storage place owner in Bồ Đề told the Nhân Dân (People) newspaper that the highest number of vehicles received every day can be up to over 200 cars and motorbikes, and this included 50 to 60 whose ownership could not be verified. He said the vehicles were not just those confiscated for traffic violations, but also those taken as material evidence in criminal cases awaiting further investigation or unidentified owners in robbery cases. Without funds to invest in storing and maintaining the confiscated vehicles, many new ones also were in a broken-down condition after being exposed to the harsh weather conditions for some time, he added. Colonel Đào Vịnh Thắng, head of Hà Nội Traffic Police Department, said that last year, his office temporarily seized 1796 cars, 18,945 motorbikes and more than 1,000 electrical bikes for various traffic violations. The ownership of about 30 per cent of the seized vehicles could not be verified. The Hà Nội Parking Company has more than 2,000 unclaimed vehicles. Why are so many vehicles unclaimed? Some people say that the owners cannot afford the fines, other expanses and complicated procedures involved in getting their vehicle back. The other expenses here include “vehicle management and maintenance fees” for the period that the vehicles are confiscated. When added up, the many kinds of fees exceed the current market value of the vehicle, and the owners or violators decide not to claim it. According to Decree No 115/2013/NĐ-CP on the management and preservation of material evidence relating to administrative violations, as well as vehicles that are temporarily seized, once the deadline for paying the fines has passed, the concerned agency has to announce subsequent penalties on local media and at office headquarters at least two times. Thirty days after the announcement, the vehicles will be officially seized and placed under the determination of concerned State agencies. The locality in charge of the confiscated vehicles is authorised to deal with them. While HCM City authorities have decided to sell seized vehicles as scrap, the capital city has, in recent years, been auctioning them. Statistics from the Hà Nội Police Department show that in 2014, more than 2,000 seized vehicles were successfully auctioned, collecting almost VNĐ5 billion. From November 16, 2015 to November 15, 2016, another 1,991 unclaimed motorbikes and self-modified vehicles were auctioned. However, said Lieutenant Colonel Đinh Thanh Thảo, deputy head of traffic police division under Hà Nội police department, identifying the vehicles’ owners is a complicated process and takes quite a long time. According to the regulations, if no one claims ownership, the police will have to verify whether the owners or the vehicles are in the list that authorised agencies are seeking (especially in criminal cases). If no one still claims ownership or the vehicles are evidence in criminal cases, the vehicles will be officially confiscated and their fate determined by State agencies. The verification process takes from one month to up to half a year. Once the ownership is verified, auctioning the seized vehicles is another complicated process. Major Nguyễn Thành Công, from Traffic Police Department under Public Security Ministry blamed the situation on the lack of detailed instructions. He said that the most difficult part is to assess the vehicle’s value after it has been kept in storage, and determine a price level for auctioning them. Back to HCM City’s decision, we have to consider the possibility of the real owners of expensive brands, cars or motorbikes, not knowing the fate of their robbed property or assets that have been implicated in other criminal cases. Even though tracking the owners can be difficult, it is not impossible, and it would a much fairer solution to allow someone to get back their lost property instead of scrapping it. Surely the digital era and modern technology would allow authorised agencies to look for and help people who’ve lost their vehicles. It is not too much to expect that an official website or network is launched where all information on vehicles, including its specifications, images, number plate and other details are published. Any person who’s lost his or her property can go to a website and check the details. And if the seized motorbikes and cars are still usable, scrapping them will be a colossal waste. Greater transparency and clarity (removal of ambiguities), fair and less complicated reclamation procedures, rational categorisation of vehicles into those that can be used and those that are better scrapped, as well as open auction processes will go a long way to addressing the problem.